Spend the upcoming weekend in San Diego enjoying everything California’s Beach City has to offer including Extreme Sailing Series and these top things to do. 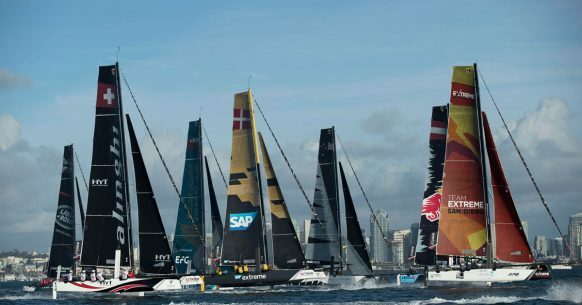 Renowned for its intense racing, the adrenaline-fueled Extreme Sailing Series™ returns to Harbor Island, San Diego, following its successful debut in 2017. The penultimate stop on the action-packed global tour will play host to a fleet of elite-level international sailing teams, whose crew boasts Olympians, World Champions and America’s Cup superstars. As well as breathtaking racing, the event will provide shore-side entertainment for the whole family from October 18-21. Enjoy entertainment, bars, food stalls, the US Sailing Education Zone and expert commentary of the racing. Also, take advantage of the perfect viewing spot from the free-to-enter public Race Village. HauntFest on Main is an exciting family friendly event in Downtown El Cajon with a pumpkin patch, costume contest, kidz zone, rides, entertainment and more! Though Caesar is beloved by the people of Rome, after his latest military triumph, senators Brutus and Cassius sense a dictator in the making. But the honorable Brutus faces a wrenching decision: stage a coup for the sake of country, or stay loyal to Caesar. The Globe’s intimate arena stage gives you an up-close seat for Shakespeare’s masterful tale of cunning diplomacy, fast-shifting alliances, and the unpredictable consequences of betrayal. The classical actors of tomorrow, now training in The Old Globe and University of San Diego Shiley Graduate Theatre Program, expertly perform one of the world’s great plays. It is time again for all aspiring ghosts, goblins, pirates and princesses to gather on the Star of India for some ghostly tales of enormous proportions. Enjoy lantern led tours as our storytellers reveal the eerie legends of our seafaring past. Ye Scallywag! is a day-long music and craft beer festival at Waterfront Park in San Diego. Live music throughout the day featuring Rancid, Mighty Mighty Bosstones, Hepcat, Less Than Jake, and The Interrupters. Festival-goers show up early to receive their complimentary SCALLYWAG tasting glass to enjoy unlimited complimentary tastings from 1:00-4:00 PM. We dare you to try and keep your wits about you while strolling through the treelined streets of Third Avenue Village. Over 20 nefarious characters and uncanny activities will torment and trick thrill seekers of all ages. Get ready to rev up your engines as the streets of Little Italy become home to over 40 classic and rare “Italian bulls,” better known as Lamborghinis. This entry was posted in San Diego Events, Top Things to Do and tagged county, enterainment, Extreme Sailing by Brent Bernasconi. Bookmark the permalink.